Product categories of Decorative Insulation Board, we are specialized manufacturers from China, Decorative Insulation Panel, Decorative Wall Insulation suppliers/factory, wholesale high-quality products of Insulation Decorative Board R & D and manufacturing, we have the perfect after-sales service and technical support. Look forward to your cooperation! Thin porcelain tile insulation decorative board: inorganic thermal insulation materials such as rock wool, foamed ceramics, foamed glass, vacuum insulation panels for construction, or organic insulation materials such as polyurethane, polystyrene board, modified molded polystyrene board, etc. The layer is made of a thin porcelain panel with various decorative effects as a protective and decorative layer. The plate-shaped product prefabricated at the factory by a special adhesive is also called a thin porcelain insulation decoration integrated board, which is referred to as a decorative insulation board. 1. Durable and durable. 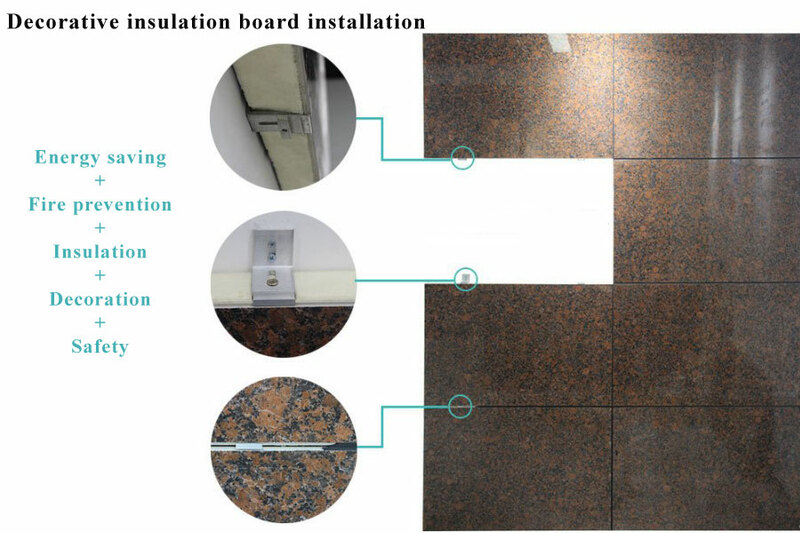 The decorative insulation panel adopts thin porcelain tile, which is resistant to acid and alkali, corrosion resistance, scratch resistance, abrasion resistance, safety and stability, and long service life. 2. Thermal insulation. Insulation material is included to reduce the thermal conductivity and achieve the function of heat insulation. 3. Fireproof and flame retardant. In the middle of the thermal insulation decorative panel, the fireproof grade A or grade B1 insulation material is used to achieve the flame retardant effect. 4. Easy installation, economical and energy saving. Compared to traditional stone curtain walls, the decorative wall insulation construction period can be shortened by 2/3. Safe and stable, the plate can be replaced at any time, and the maintenance is simple. 5. The color is stable and the pattern is rich. It can highly imitation of the surface effects of traditional decorative materials such as stone, wallpaper, wood, and paint.